In a household with kids, there will always the odd accident that results in something spilling on cushions. Avoid any long-term damage to the cushion filling by cleaning out the spillage as quickly as possible. The first step it to immediately use paper towels or a cloth to absorb as much of the liquid as possible. This will limit absorption and make the next cleaning step much easier. Failing to do so will mean having to buy new cushions. A mild detergent, bathtub, some warm water and paper towels are all that will be required. Fill a bathtub with warm water and submerge the cushions. There needs to be enough water to cover the cushions completely. Add the detergent to the water, based on the recommendations on the label and swirl the water and mix it in. Place the cushions in the water and press it down. This will work the water and detergent into the cushion. Pressing continuously will help clean out the insides of the cushions. Watch the color of the water. Keep changing it until the water no longer gets dirty. Once the cushions are clean, drain the soapy water and refill with clean water without detergent. Now press and repeat until all the soapy water is gone from the cushions. Squeeze the cushions out as much as possible and remove any remaining water with the paper towels. 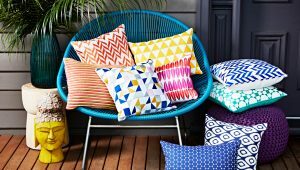 Once the cushions are no longer wet, dry them outdoors to remove the last elements of moisture. Get your custom foam cushions from The Foam Factory, providers specialist and custom foam products.